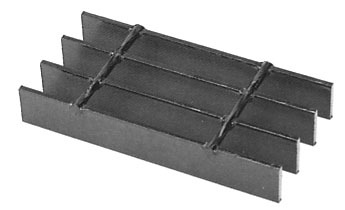 Light Duty Carbon Bar Grating includes bar sizes of 3/4” x 1/8” up to 2-1/2” x 3/16”. It is primarily used for pedestrian traffic and for light, tired, rolling traffic such as carts, dollies, and hand trucks. 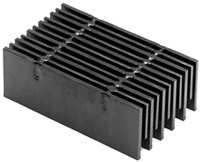 Heavy Duty Carbon Bar Grating includes bar sizes of 1” x 1/4” up to 6” x 3/8”. It is primarily used where heavy vehicular traffic is present including industrial plants utilizing fork lift trucks, highways, and bridges. Aluminum Bar Grating offers a corrosion resistant alternative to carbon. It is lightweight and strong, and highly utilized in corrosive environments including food/beverage preparation, water vessels, and sewage treatment facilities. Stainless Steel Bar Grating offers an alternative to carbon and aluminum materials in protection against severe corrosive environments such as chemical, food, and hydro processing areas.